← Building a Hamilton-based Seed Library? Hello, world! I’m working on some lengthier posts, but in the meantime I’d like to share with you something I found in the archives yesterday that made me smile. The context: I’m working on a couple chapters for my dissertation that focus on the idea of a ‘landscape of co-operation’ in the 19th century dairying countryside and all the ways in which that rational, scientific, spatial, and social ‘plan’ was thwarted by local networks, bad roads, grumpy cows, farmers shopping around for the best deal for their milk, and so on. A group of folks I call cheese ‘reformers’–virtually all of them male, land-owning, and white–spent most of the late 19th/early 20th-century complaining incessantly about farmers they considered unprogressive, who wouldn’t co-operate with their visions for a progressive dairy industry. The most common complaints were about farmers who would skim and/or adulterate their milk, and those who stopped sending milk to their local factory if they found a better deal elsewhere. In 1912, one patron aggravated the Board of Directors of the East Zorra & Blandford Cheese Manufacturing Co. so much that he made it into the Board’s minute book, which means I get the pleasure of reading about it. Now, who knows what really happened–perhaps it’s the truth, perhaps he couldn’t read well, perhaps he did switch factories simply because the cheese maker was hassling him about the milk–but no matter the reason, I imagined the directors rubbing their temples and shaking their heads in unison. It must have infuriated them in the way I’m seized by brief moments of rage when a student explains they didn’t know what to read because they didn’t look at the syllabus. It also, however, made me laugh. 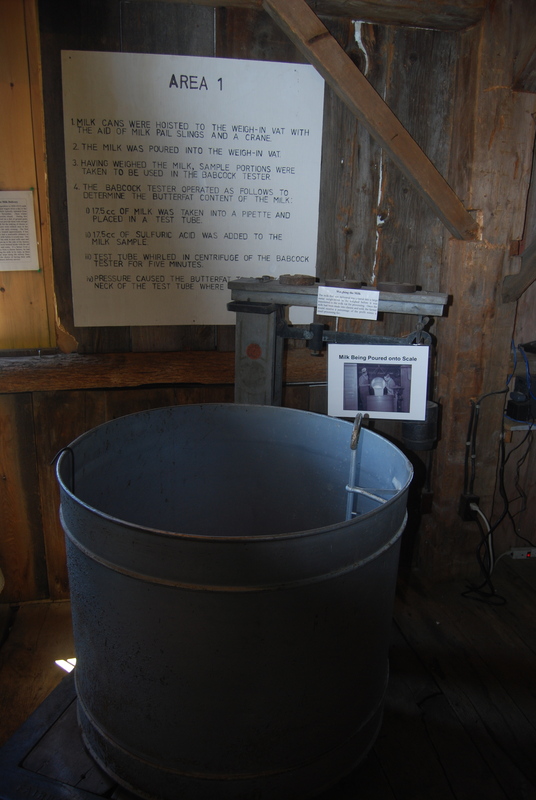 Photo: Milk weigh-in station [photo by author], Ingersoll Cheese & Agriculture Museum, Ingersoll, ON. Museum website here. Archival Reference: Oxford County Archives, 10A55 – East Zorra and Blandford Cheese Manufacturing Co. (Minute and Account Books 1894, 1897-1922, 1926-1934, 1938-1948); File 7: Minute Book, 6 March 1911 – 17 February 1922, pp. 26-27.